Apple cider vinegar is a hot topic in the wellness industry at the moment. I saw a bottle of Ostler’s cloudy cider vinegar in my local store and decided to give it a try. 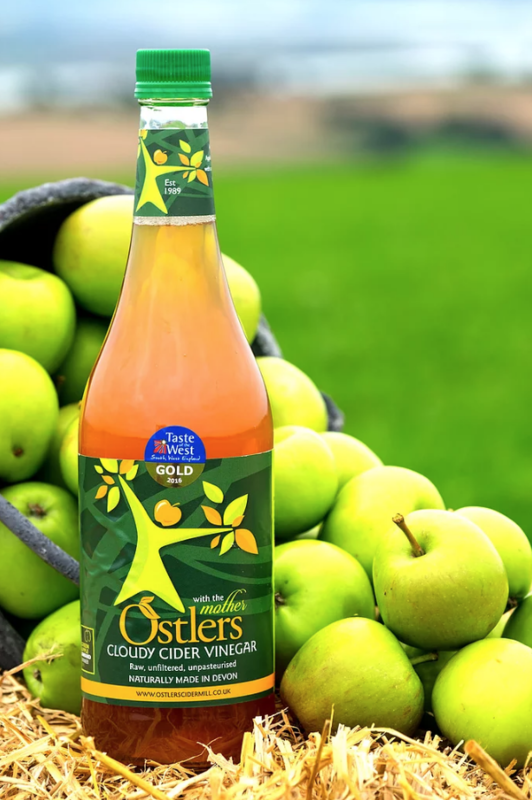 Unlike other apple cider vinegars, you might have seen in the shops, this one contains the “mother” which is the cloudy substance that shows that the enzymes and nutrients from the apples have not been destroyed through over-processing. Some people believe that the “mother” is responsible for the health benefits, but there is no hard evidence to support this. 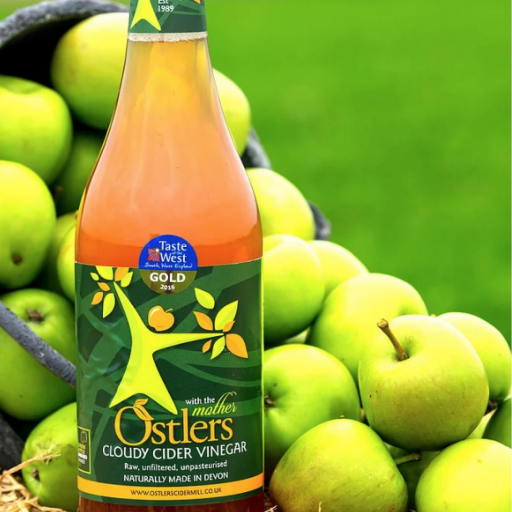 Ostler’s apple cider vinegar is organic and has won multiple food and environmental awards. It has a very distinct flavour and I have used it in salad dressing several times and received many compliments on the refreshing but punchy taste. Some people like to dilute apple cider vinegar in water and drink it, because it has been linked to all sorts of health benefits, including weight loss, lower blood sugar levels and improved diabetes symptoms. Elevated blood sugar levels are a problem for people with diabetes, so they can really benefit from anything that can keep blood sugar levels stable. Apple cider vinegar has been shown to improve insulin sensitivity during a high carb meal and significantly lower blood sugar responses during meals (1, 2). Given that vinegar lowers blood sugar and insulin levels, it may also be helpful for weight loss. Indeed, several studies in humans have suggested that vinegar can increase satiety helping you to eat fewer calories (3). Vinegar consumption may also lead to reduced body fat and lower triglyceride levels (4), however, it is important to bear in mind that in this study patients were consuming 30ml of vinegar a day for 12 weeks! As a nutritional therapist, I don’t advocate relying on one particular food to improve your health. A balanced approach is recommended, however what is clear is that apple cider vinegar may certainly be useful as a weight loss aid by increasing feelings of fullness. Apple cider vinegar appears to be safe and healthy, and no side effects are associated with normal consumption. It should not be relied on as a miracle product but can be incorporated into a healthy diet plan in order to help with blood sugar and weight control. (1) Johnston, C.S., et al. (2004). Vinegar improves insulin sensitivity to a high-carbohydrate meal in subjects with insulin resistance or Type 2 diabetes. Diabetes Care, 27:1, Jan 2004. (2) Johnston, C.S., et al. (2010). Examination of the antiglycemic properties of vinegar in healthy adults. Ann Nutr Metab, 2010:56(1), 74-98. (3) Östman, E., et al. (2005). Vinegar supplementation lowers glucose and insulin responses and increases satiety after a bread meal in healthy subjects. European Journal of Clinical Nutrition, 59(9), 983–988. (4) Kondo, T., et al. (2009). Vinegar Intake Reduces Body Weight, Body Fat Mass, and Serum Triglyceride Levels in Obese Japanese Subjects. Bioscience, Biotechnology, and Biochemistry, 73(8), 1837–1843. Liam Gallagher using Ostlers Cloudy Apple Cider Vinegar! Ostlers are finalists at Taste of the West awards! Ostlers win yet another Gold at taste of the west. Celebrations here again!! Our 7th Gold in a row at Taste of the West!! Celebrations here - as Ostlers wins a Green Apple Environment Award ! Ostlers Apple Cider Vinegar wins again!